The world premiere of a new stage version of Robert Tressell's autobiographical novel takes place rather fittingly in Liverpool where the author died and is buried. It is essentially an anti-capitalist story on a human scale revolving around the working lives and hardships of a group of painters and decorators working in the fictional town of Mugsborough c1904. Among this group of workers is the character Owen, largely based on Tressell, who has a vision of society that is fair and just and he makes it his mission to enlighten his fellow workers about how socialism could rid them of inequality forever. I was given a copy of this book with the tongue-twisting title many years ago when I was 16 years old and had just become a member of the Labour Party Young Socialists (I now know this to be an oxymoron, but I was young and impressionable back then). I was told that it was the “trade-unionists Bible”, so diligently; I went off to find a quiet corner to read it. Even though my politics are now quite different to what I believed in then, this book has remained on my bookshelves, joined a little later by The Condition of The Working Class in England and The Communist Manifesto, amongst others that left an impression on me, opened my eyes and made me question everything. And although with the passage of time, it is difficult to remember precisely how I felt when reading this book, I can recall with certainty that it had a profound effect. So, when I noticed that the Liverpool Everyman Theatre was staging an adaptation of this book, I thought I would dust it down and re-visit a novel which has sold more than a million copies worldwide and take a visit to the Liverpool theatre suitably located on Hope Street to see this production. The Play has been adapted for the stage many times and on this occasion by Howard Brenton, with direction from Christopher Morahan. A small cast of 12, had some taking on more than one role and exchanging the paint-strewn ragged clothing of the workers for jowly face masks and fattened bellies in brass-buttoned waistcoats to become the well-fed, cruel, conniving and oppressive employers in an efficient and well orchestrated changeover routine. The stage was set in the old house where the painters and decorators slogged away, and I must say it was difficult, on one of the hottest nights in July to sit in an old stuffy full-to-capacity theatre with an audience of the lightly dressed middle-aged, and imagine myself in the conditions of the squalid, cold, dark, damp and fume-ridden misery in which these workers spent most of their waking lives. I had my doubts too, about how Tressell’s novel, a long and weighty tome of around 700 pages and densely packed with detail, dialogue, dogma and doctrine could be put across in a production of little under two hours, and I think it would be fair to say that anyone would struggle to do it justice. But by focusing on several key scenes and building the story around them they managed to tell the story of Owen the Socialist and his downtrodden fellow workers with remarkable flair and imagination. With the addition of a couple of modern twists at the start and finish involving an estate agent and prospective buyer, and with reference to several of the many modern parallels, this production managed to marry the old with some new, rather well. But much of the original novel had to be left out, so if you’re still interested after this review, it is worth reading the book. One of the scenes, no doubt chosen for its particular relevance, was a tale of corruption and “fiddling” among the Councillors and town Capitalists, bringing to mind the recent expenses scandal in the modern corridors of power and another was of a couple trying to work out how to pay their considerable debts with little income, something with which many more people have had to grapple with during this recession. The characters were well cast, portrayed and convincing; Finbar Lynch as Owen looked every inch the “radical” and could easily have been at home outside the Theatre selling copies of the Socialist Worker or similar. Excellent use was made of lighting and sound to take the audience beyond the stage and into the homes, workplaces, streets and public houses of the fictional town of Mugsborough and to create a mood that was mainly dark and depressing. A story of its time, with workers cast generally as “salt of the earth” types and the Capitalists being of the “greedy fat cat” types in the “Michael O’Leary mould” (read Brendan O’Neill - http://www.spiked-online.com/index.php/site/reviewofbooks_article/9078/) who had no shame in revealing what they really were and what they really wanted – ruthless and uncompromising in the pursuit of personal profit. O’Leary may well have acquired his methods from the owner of Rushton and Co. (the building firm in the book), who deploys every trick in the trade to maximise profit and squeeze every last drop of life from his workforce to feather his own nest. Just as O’Neill reminds us in his article that Capitalism is “still about exploitation, division and conflict” you’re left in no doubt by the end of this play that this was and still is the case, and you’ll probably need a stiff drink or two in the bar downstairs afterwards to liven you back up again! Robert Tressell, the author of the book with the tricky title (known affectionately by me as “baggy-trousers”) was the nom-de-plume of Robert Noonan, born in Dublin in 1870, his own story is one that could quite easily become the basis of a successful “misery memoir”; because his life was quite hard and along the way quite sad (like a lot of people who suffer unemployment, poverty and illness). He was illegitimate (a terrible sin in Ireland), and his family life was fractured, but he was fortunate enough to receive a good education (in the days when this actually meant something), which gave him scholarly and literary interests outside the laborious world of his day-job. Like many of the Irish, he emigrated in search of work, settling in South Africa where he worked as a decorator. He married in a hurry and had a daughter, but his marriage was unhappy and his wife regularly unfaithful, so they divorced and he was granted custody of his only daughter Kathleen and moved with her to Johannesburg. He became active in his Trades Union, becoming Secretary of the Federated Building Trades Council in Transvaal, and he also played a part in launching the International Independent Labour Party but returned to England in 1901, to avoid the outcome of serious hostilities that were starting to build up in South Africa. His passion was for politics and he took up this interest once more, becoming involved in the 1906 General Election alongside fellow socialists as part of the Social Democratic Federation. Although he was a highly skilled decorator, he found it hard to find work that paid decent wages and being a man of principle, he often refused to compromise his trade to the speed and shoddy workmanship dictated by his bosses, and so was sacked at the same time as a recession in the building industry took hold. As a result he experienced long spells of unemployment and poverty. It was during his time out of work, that he began to write his novel, based on his own harsh experiences in the building trade, his observations of the way he and his fellow workers were treated and his Socialist beliefs; a story of the lives of ordinary people, who were quite literally dying on their feet for want of the basic necessities of life. A combination of passion, talent, Irish heritage and his own justifiable hatred of the English capitalist class culminated in what many have since come to describe as an “English classic novel”. He submitted his novel under the name Tressell (a 'trestle’ being one of the tools of his trade), because he feared being blacklisted as an agitator and socialist, but it was repeatedly rejected and he began to suffer from bouts of depression and fell ill with tuberculosis, no doubt as a consequence of the poverty and circumstances in which he was living. There was no welfare system, no benefits to claim or counselling for the unemployed back then, just poverty, starvation and the workhouse. Unemployment benefit did not exist until many years later (although there were many welfare societies funded by workers themselves and various charities offering “handouts” subject to “the proper” answers to rigorous questions). But despite his poverty, illness and considerable hardship, Tressell was not a man to lie passive, and he put his time to good use, writing and agitating. He eventually found work in Liverpool, and there begins his connection with this oft-talked-about City, but his health deteriorated and he ended up in the workhouse hospital where he died of bronchial pneumonia and cardiac failure in 1911, at just 40 years of age. He was buried in Walton cemetery in Liverpool in an unmarked paupers grave, which was sought out in the 1970’s by a group of admirers who installed a headstone engraved with the names of Tressell and the 12 other paupers all buried in the same spot. His novel remained in manuscript, but his daughter was determined to get it published and after many unsuccessful attempts, Kathleen eventually sold it without royalties. The first original and un-shortened version, which ended as Tressell intended it to in a more upbeat fashion, was published in 1955 becoming available in paperback in 1965. It was reprinted 23 times within a few years becoming a highly successful book, popular with Socialists and those “on the Left” and others whose lives were touched by the misery and mis-fortune Tressell recalls. Its success in part must also lie in it’s capability to rouse so many feelings; rage, pity and the desire for action and change. Tressell wanted his novel to be an enjoyable and readable story full of human interest, with scenes and characters typical of any town and recognisable by many. He had not intended it to be used as anti-capitalist propaganda, although many now do refer to it in this way. Unlike Marx, he doesn’t provide an analysis of capitalism, instead, he simply demonstrates the system’s absurdity, impracticality and unfairness, appealing to ones sense of what is right and just, rather than highlighting any inherent flaws. The message in the book is one of hope and optimism that one day there will be an alternative vision of society, “a golden light that will be diffused throughout all the happy world from the rays of the risen sun of Socialism” and was written at a time when the benefits of mass industrialisation and production were being experienced by some; Tressell just wanted a share for everybody. Although not an academic piece of work, he still comes to the same conclusion that many acclaimed writers have taken much longer to illustrate and to much smaller audiences; that of exposing the capitalist system as being responsible for unemployment, poverty, inequality and much human misery. It is fundamentally a story about the struggle between the under-privileged and their oppressors, an anti-capitalist tale on a human scale, revolving around a group of workers in the building industry, at the beginning of the 19th century, at a time when unemployment was high and the threat of poverty was “just around the corner” for many. 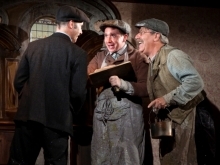 Set in the town of “Mugsborough” to incorporate the word “mug” in one of the many puns used throughout the book (Mrs Starvem, Mr Rushton, Mr Slyme, Mrs Knobrare, Councillors Grinder and Weakling etc), it portrays the life of the workers at the time, in an England where everyone was supposed to “know his place” and be “happy with his lot”. Among the group of workers is the main character Owen (based on Tressell), who is a Socialist with a vision of society that is fair and just. Owen is always on the look-out for the chance to talk to his fellow workers and rouse them in to action. With great patience and tenacity, he tries to enlighten them about how Socialism could rid them of inequality forever, but they will not listen, so he labels them the philanthropists of the book title, because they give the results of their hard work to those already much richer simply because they think that this is life’s natural order. Despite their poor working conditions, low pay, the ever present threat of redundancy and joblessness, starvation and death, Owen remains faithful to his beliefs and optimistic about the future. In the face of considerable hardships and the passivity of his fellow workers he strives to change their lives for the better by dispelling the myth of the “not for the likes of us” attitude and the self-pitying, slothfulness and stupidity that has them trapped. Although in a minority he joins up with other Socialists and sells pamphlets and educates himself at home from second-hand books, studying in the little free time he has available. Throughout the novel, he constantly seeks to prove to the workers and the reader that the only remedy to the sorry lives they are all living is Socialism, and hardly a chapter goes by without mention of this. My own paperback copy has an introduction by the recently departed Alan Sillitoe, who describes the book as “a great read, real lives inhabited by real people” but also as a tragedy, because “a tragedy cannot be written about creatures of the jungle, only about those who try to get out of it – or those who succumb to it knowing that it is possible to transform it. Therefore Owen is the most tragic figure in the book”; the tragedy of those of us who can see that the society we live in could and should be a much different and better place, if only….and who keep on striving, knowing that as Sillitoe so accurately points out that it is “only what the workers take that is helpful. What they are given is useless”. It’s getting them to take it that drove Owen and drives many of us with similar aims into occasional raptures and then plunges us just as quickly into periodic moments of despair. As society has changed so much, particularly in terms of welfare reform, to set the scene, it is worth noting that in 1906 (around the time when the book was written), a skilled painter earned £1.5s in a good week, but they suffered seasonal lay-offs and were not compensated if bad weather, or poor daylight restricted their work, so income fluctuated greatly. The average cost of a basic living for a childless couple at the time was £1.0s 4d, which included rent, food, fuel and payment for furniture – anything else that many take for granted today in the form of “pleasure” such as books, theatre, leisure pursuits etc. was unaffordable for the mass of the population. When unemployed they received nothing, there was no unemployment benefit or welfare support system and so they had to live “on tick” (credit from others) and hence were always in debt to somebody for something for most of the time. By the end of the opening chapter, in which all of the tradesmen are introduced whilst working together on the renovation of the house of one of the wealthy Capitalists, known as “the cave”, it is clear that Owen is considered “odd”, “a bit of a crank”, as he has “no interest in football or racing” but “is always talking a lot of rot about politics”. Owen observes that his fellow workers have many opinions, but that they are based on very little factual knowledge, as most of them “could not read a dozen sentences without stumbling”. Despite his despair at the ignorance of his fellow-workers and his occasional anger and frustration, he shows them compassion and understanding never looking down on them or seeing them as inferior. Tressell describes how the foreman, known by the workers as “old misery”, has them all living in fear. With unemployment high, and men hanging around outside looking for work all the time, “old misery” plays one man off against the other, in order to fire the most expensive and replace him with another less costly man (capitalism at it’s most ruthless and blatant with people quite clearly just an expense on the balance sheet). Everybody is afraid of “old misery” because, just like any employer, he has the power to deprive of the means of earning a living. The homes of the tradesmen are all similar; described as typical of many at the time; poor quality, rented, terraced, two rooms downstairs and two up, sparsely furnished with second–and-often-third-and-fourth-hand pieces. A fireplace with drying clothes hanging above and with work and money to buy coal and a fire blazing, some semblance of homely comfort. Bread, margarine, cheese and a “bit of bacon” and tea “dust” with sugar, seems to form the main part of their diet. There’s no haranguing about counting calories, five-a-day, trans-fats and portion-control, as there is barely enough of a fairly poor diet to maintain them anyway. Perhaps today when austerity, thriftiness and getting back to the simple pleasures of life by consuming less is talked about in such a sentimental way by various commentators, this is what they have in mind? Abject and miserable poverty! For some, austerity has always existed and is nothing to wax lyrical about and nor is it a solution to present day ills. To most people second-hand and second-best doesn’t mean “vintage” and “living within your means” it means experiencing the worst that society has to offer, when the best is still on the tables of others. Debt was as prevalent then as it is now – “when you’re not working, we must either get into debt or starve”, and one couple’s evening is spent totting up what and who they owe, and worrying about who to pay first and who can wait a little longer. Blaming his wife for her "bad housekeeping", you get the sense of how hard it is for working class women, confined to the home by the attitudes of the time, with no financial independence and “allowed” to work for a pittance doing menial labour to supplement the family income when the man of the house is “let go” (an early friendly Capitalist term for “You’re Fired”). In a well-observed depiction of the type of scene taking place in the homes of the low paid and irregularly employed, the stress gives way to a row, and then tiredness and worry take over and the relationship begins to change. How Tressell manages to get humour out of such a scene is startling, but plagued about the debt and with the only clock in the house not working, this poor, sick and worn-out man, wakes up periodically throughout the night, worrying that he may be late for work, and eventually gets up and heads off out only to be stopped by a suspicious policeman, none the wiser about the precise time - at four a.m! Although poverty was widespread, so was pride and Tressell describes how many tried to hide their evident destitution, because they were ashamed and somehow felt responsible. Whereas today, poorer families can alleviate their poverty to a limited degree with tax-credits, benefits or by calling on their “flexible friend” and like many millions do so openly and with a sense of entitlement; no shame attached. The novel paints a generally bleak picture with only a few scenes of light-heartedness and merriment at the works “beano”, in the Pub and at Christmas. Life seems to be just one long drag making the book a heart-rending read. There is a whole chapter in the book entitled “The Great Oration” detailing a speech made by a visiting Socialist Professor in which Tressell gets across all of his Socialist beliefs and messages. In other places this “propagandising” is more subtle, being incorporated into the story itself. In one scene Owen shows the workers what he calls the “money trick” by using pieces of bread from his lunchbox to represent raw materials, the means of production, the worker, the capitalists and money and reveals how capitalism robs the workers of the fruits of their labour. With a few slices of bread, like an enthusiastic and resourceful teacher, he gives a simplistic and effective demonstration of surplus labour, value and profit. In giving this book it’s recent reading, I was reminded of how much the world has changed for the better, but also shocked and frustrated at how little progress has been made in exposing and destroying the failings of the Capitalist system, despite such great effort on the part of so many for so long (and of course there are many reasons for this). It was also remarkable how many of the arguments used to justify and preserve this system then, still prevail today. Having recently accepted a cut to our pay and leave in the public sector one colleague was heard to say “we have to take it on the chin because of the state of the economy; everyone has to”. When compared to an extract from the book written over 100 years ago; “We really ought to be thankful and consider ourselves lucky to ‘ave a job when there’s such a lot of chaps walkin’ about doin’ nothing”, I was left in little doubt that there is still plenty of confusion among many about what can and should be done and by whom. Owens response then was -“Do you think that the affairs of the world are something like the wind or the weather – beyond our control? And if they’re bad we can do nothing but just sit down and wait for them to get better?” which I must say is a little more polite than my own recent response, but nevertheless, economic problems are still then as now seen to be beyond comprehension and “not for the likes of us to worry about”. There doesn’t seem to be anyone challenging the politicians who with low horizons, are cutting back on everything and in danger of taking us all on a backward path from development and progress. And, just last week with this book fresh in my mind, I happened across the Jeremy Vine show on Radio 2 and tuned in to hear someone say that it is “wanting things that makes you poor” and I was taken aback by the stupidity of this remark and by the casual acceptance of it as clever and factual. What the speaker was trying to advocate in “Austerity UK” is that you should “live within your means”; an argument Owen fights against throughout the book and that is increasingly popular again now that everyone has maxed out their credit or spent the bonus from the bank. But in fact, it was living within their means that was killing the poor then, and is restricting us now, because the means are insufficient to get by on and are stifling development. The simple fact is that most of us could have and still need a lot more. And even if we had every material need and were not living in poverty, we might still want more and why not? Why would anyone not want to have more and the best of everything? Why would anyone not want to continue to improve things? You’d have to be a strange kind of person to have no desire for the good things that humanity can provide, wouldn't you? Would you really drive around in a “rust-bucket” whilst being over-taken by a Ferrari? Eat from Tesco’s basic range while others dine more finely? Live in a small house in the shadow of another? As Owen carefully explained to his fellow workers then, and which still needs to be said now, “most of the people who do nothing get the best of everything…compare the quality and quantity of the clothing possessed by the wife or daughter of a rich man…their homes, clothing, boots, hats, jewellery and their food. Everything must be of the very best…but for most of those whose labour produces all these good things, anything is considered good enough”. Whilst inequality still exists, just as it did in Owens time, both rich and poor alike are castigated for wanting more. While the real solutions to society’s problems go un-discussed, the blame is put at the door of everybody for being greedy and the mantra of the day is to put a brake on consuming. Daniel Ben-Ami in his book "Ferraris For All: In Defence of Economic Progress", argues that society should not feel guilty for consuming and that continued development and increasing affluence is desirable and could benefit everyone. Daniel, a modern-day man with modern-day solutions, may like Owen be considered a “crank” by some for putting forward solutions that advocate spending more during a recession, so if you want to hear or challenge what he has to say he will be developing his arguments at the Manchester Salon on 24 November - Ferraris for all: is economic growth such a good thing? There is no doubt in my mind that “baggy trousers” is a must-read; yes it is kind-of old-fashioned, kind-of sad and miserable, definitely a tragedy and probably not a “summer on the beach kind-of novel” and yes, in parts, it does depict many of the working class as hapless, fatalistic individuals. But on the other hand, there are many modern parallels and most of all it has at its heart a real hero in Owen; an ordinary man who despite considerable hardship knows that it is possible to do something about the things that are wrong in society and who stands up to his ruthless employers, alongside the workers who laugh at him and call him a crank to defend what he believes in.